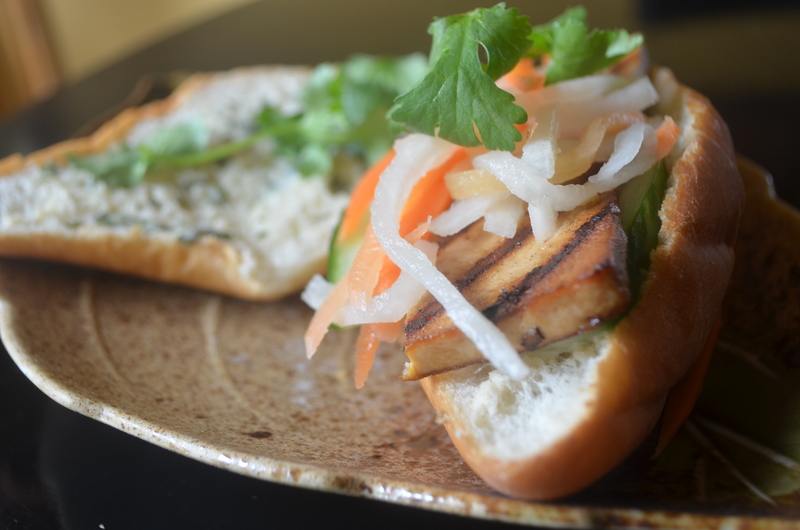 At Me So Hungry in Austin, I tried the lemongrass tofu banh mi—my personal favorite from the truck. 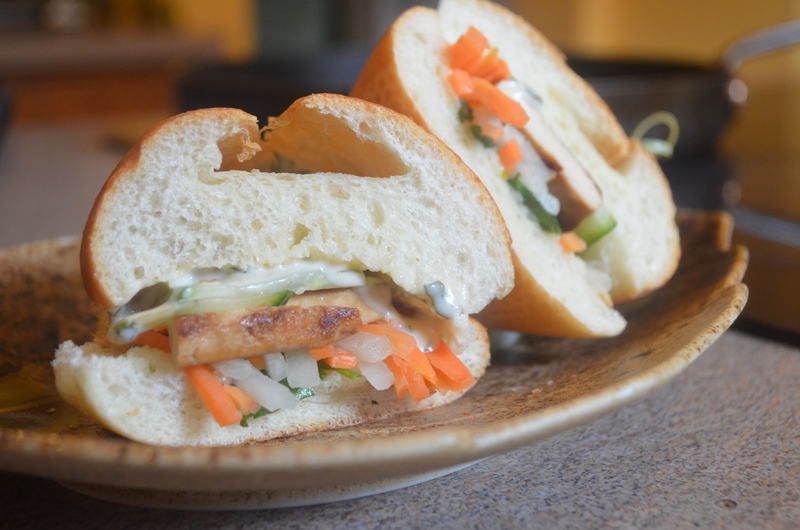 With the help of my mom, I have a new recipe today… our take on the banh mi we tried! You can read the full review here. I first tried banh mi last summer in San Francisco, where the Asian American Donor Program introduced it to me as a Vietnamese sandwich. Excited to be surrounded by all the delicious Asian food of the Bay Area, I was incredibly depressed to hear I was being fed a sandwich. I mean, I was only gonna be there for a little less than two days! After some trouble with jalapeños at Me So Hungry—and in San Francisco, for that matter!—we decided NOT to include any of that vile, hell-bringing pepper. Instead, we have lemongrass. Beautiful, beautiful lemongrass. Lemongrass is an incredibly amazing, fragrant grass used in Asian cuisine. Its fresh, clean, lemony aroma smells heavenly. 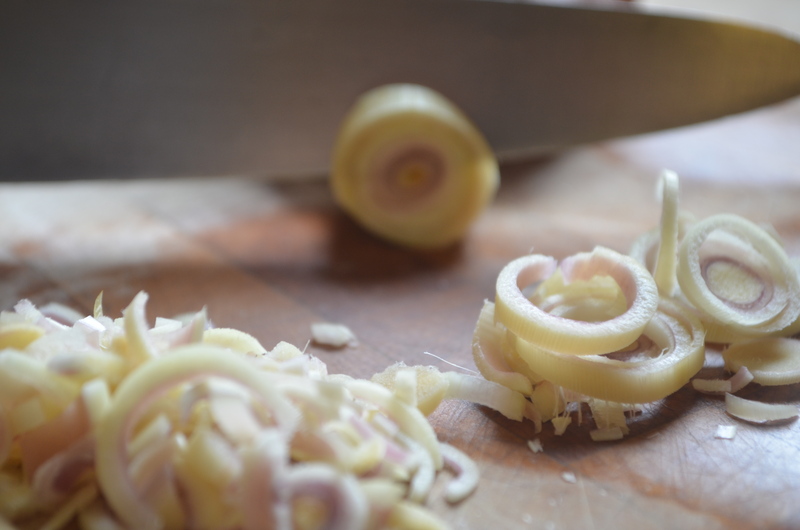 Personally, I’d love to have some lemongrass in the kitchen just to smell. All the time. The best part of this banh mi is that it’s pretty much all vegetables. By choosing to eat vegetarian—whether every day, on weekdays, on Mondays, or just a meal here or there—you’d think eating mostly vegetables would be a requirement. Well… not really. You can still fill yourself with processed, fake “meat” that makes you feel much, much worse than having wild-caught salmon or organic chicken. Trust me, I know. I went the super-processed route a little after I started eating mostly vegetarian, and it wasn’t pleasant. If you really want to feel good while eating vegetarian, you need to be eating a meal where you can see the veggies. Thankfully, this banh mi is nearly all vegetables. It’s also important to buy ORGANIC tofu, since soy is nearly always GMO (genetically modified organism)! Geez, I feel like this post unloaded all the stops, from organic food to processed food to even vegan mayo. In order to not bog down this recipe with all sorts of preachy stuff, I’ll move on. 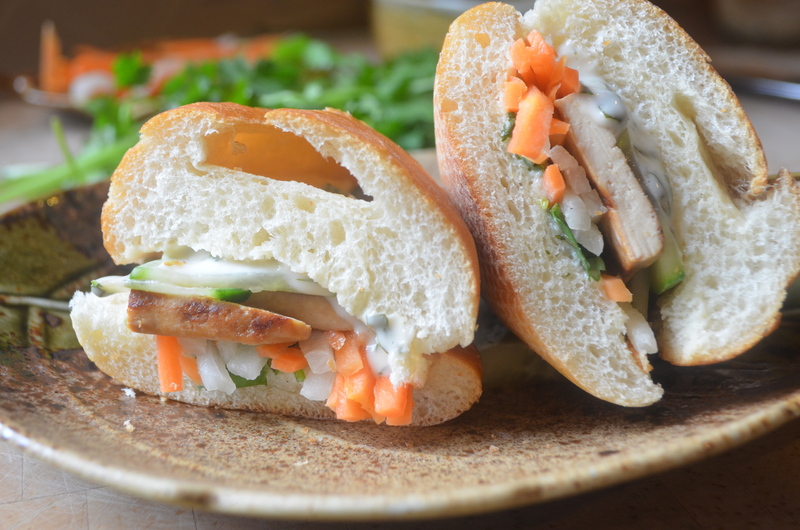 This banh mi is great for all meals, but lunch would probably be best… just like any submarine sandwich, except this one is Vietnamese! Actually, banh mi is an infusion of both local Vietnamese and the colonizing French cultures, making it a nice East Meets West meal. Naturally I feel personally connected to the banh mi. I know you probably only came here for the pictures and the recipe so I’ll let you go. If you decide to give it a try, be sure to comment below and tell me how it went! I’d love to know! Also, you can stay connected with us through RSS, Facebook, and Twitter by using the links at the bottom and side of the page. On top of that, you can sign up for our email newsletters (I promise you won’t get spammed)! Note: Needs to be made 3 to 7 days ahead of time. Combine all ingredients and store in an airtight container. May be stored in the refrigerator for up to a month. Note: Be sure to marinate the tofu overnight. Drain the tofu from its package, and wrap it in dry towels to rid of excess water. 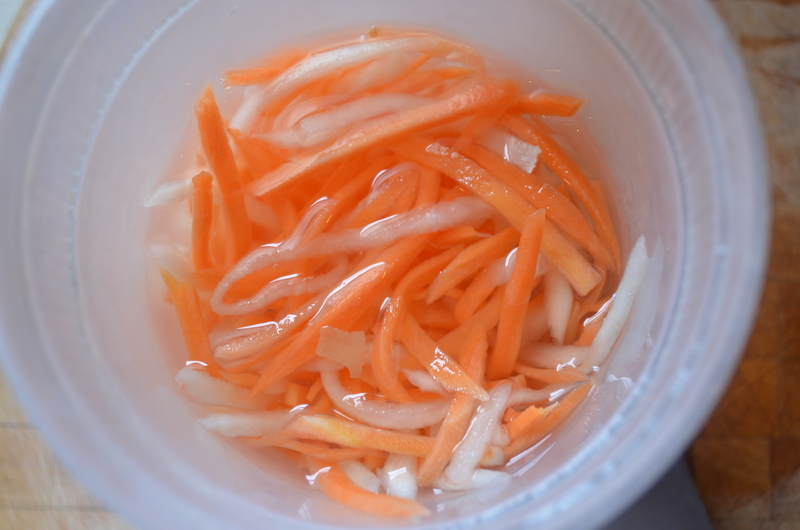 Let it sit for about 15 minutes, then slice in rectangular sizes. Marinate the tofu overnight (or up to two days) with the soy sauce, lemongrass, garlic, and sugar in a ziplock bag. 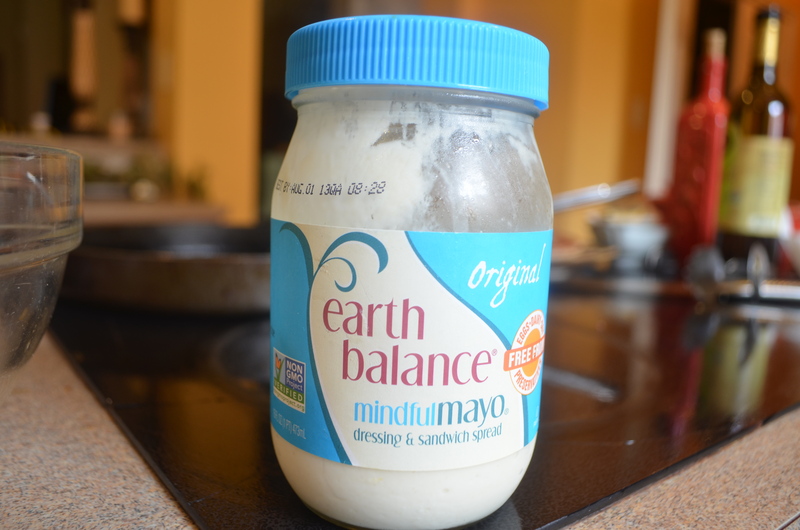 Combine the cilantro mayonnaise ingredients in a bowl. Keep refrigerated until needed. Heat a griddle (preferably one with ridges) with 1 to 2 tablespoons oil. 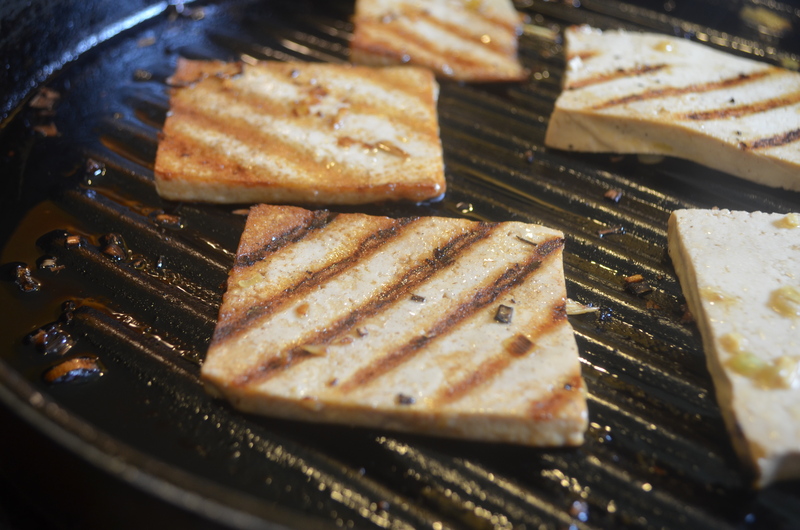 When hot, fry the tofu slices on both sides until brown. Remove the tofu from the pan and place on a plate. Lightly dab the tofu with a paper towel if oily. Toast the bread, then cut in half. Generously spread both sides of the bread with cilantro mayonnaise. 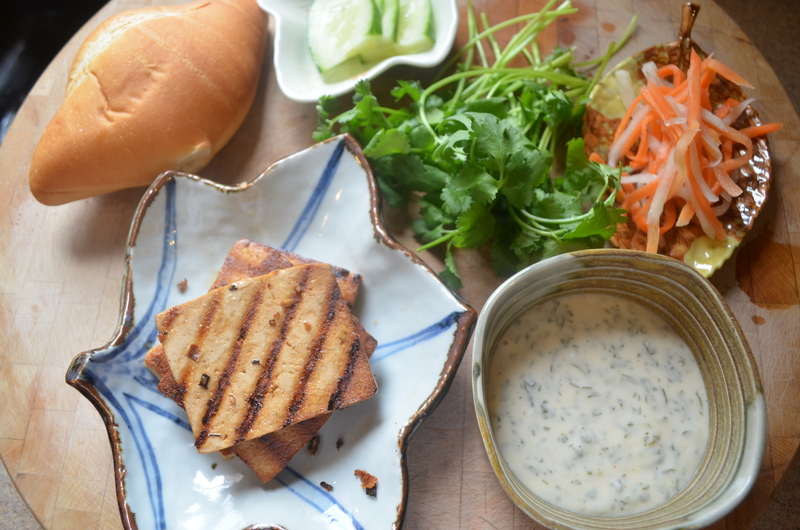 Layer the bread in the following order: a few slices of cucumber, 1 to 2 tofu slices, a handful of pickled daikon and carrots, and a few sprigs of cilantro. A few weeks ago, I had the opportunity to visit Me So Hungry, a veg-friendly Asian-fusion food truck in Austin, Texas. The city of Austin is considered the most vegetarian-friendly city in the entire United States, with nearly every single restaurant or food truck offering vegetarian—and quite often, vegan—options. And in some places, it’s more like a “meat option” since everything is more or less meat-free. For that reason alone, Austin is truly amazing. One of Dallas’ problems is that trying to eat “vegetarian,” with or without an exception for fish, can be extremely difficult depending on where you are and what kind of food you’re eating. Yet for some reason, squashed in between the heavy meat-eating, conservative Texas landscape, you find the vegetarian, progressive, eclectic city of Austin. Because of a food shortage, the truck was closed earlier that day, but I made it just in time for their late opening. It was definitely quiet there—not just at Me So Hungry, but at the surrounding trucks too… although it was probably just because of the time I was eating. 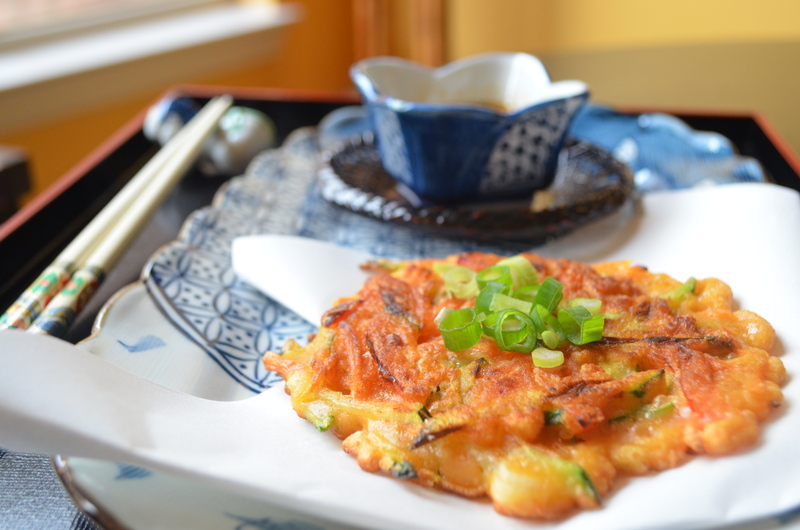 My mom makes a really good vegetarian pajeon. She came up with the recipe herself, so it’s pretty unique. 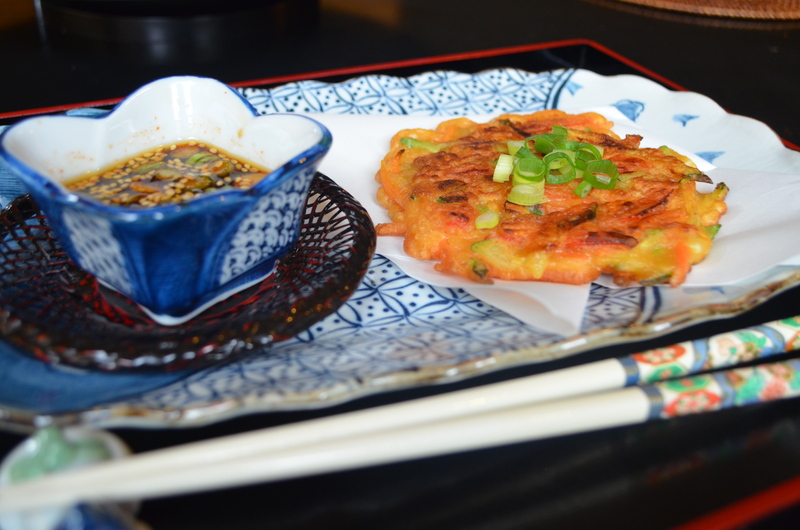 Two of the key ingredients for both the sauce and the pancake batter are gochujang (hot pepper paste) and the vegetable pancake mix. You should be able to find them at any Korean market or general Asian market. 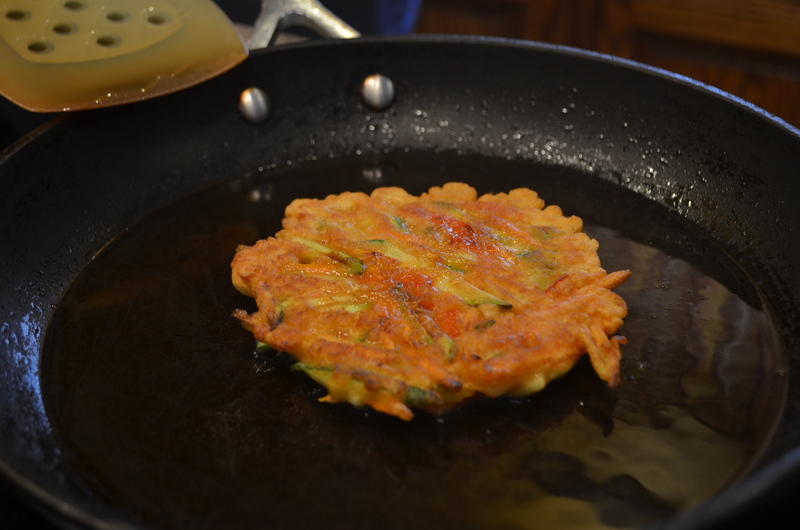 Please please please don’t forget these—your Korean pancakes just won’t be the same without them! I’m trying to save you from impending culinary doom! Watching Mom make it, I realized that it’s not actually that difficult. Also, it tastes good. Very good. We experimented a little on the sauce, adding gochujang to it for some more flavor. Luckily, nothing exploded… except the flavor. At least you’ll have a unique sauce to go with your Korean pancakes! 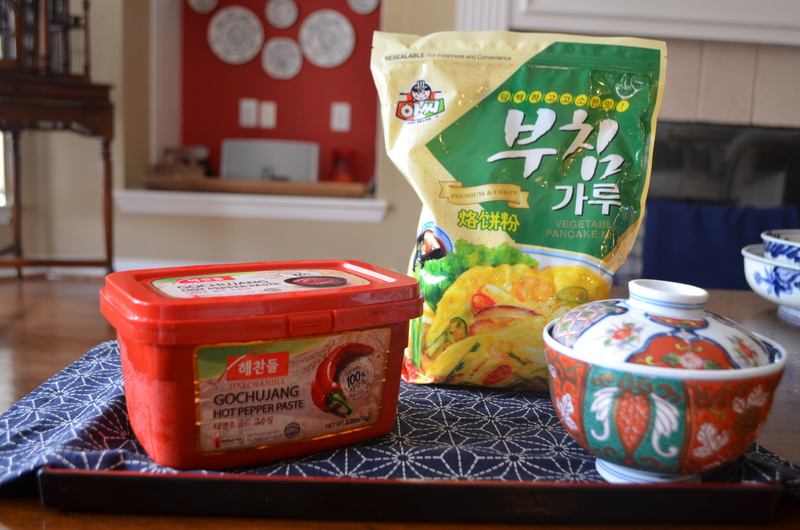 ½ tablespoon gochujang (hot pepper paste) ~ this is optional, but it makes it unique! It tastes great, too! 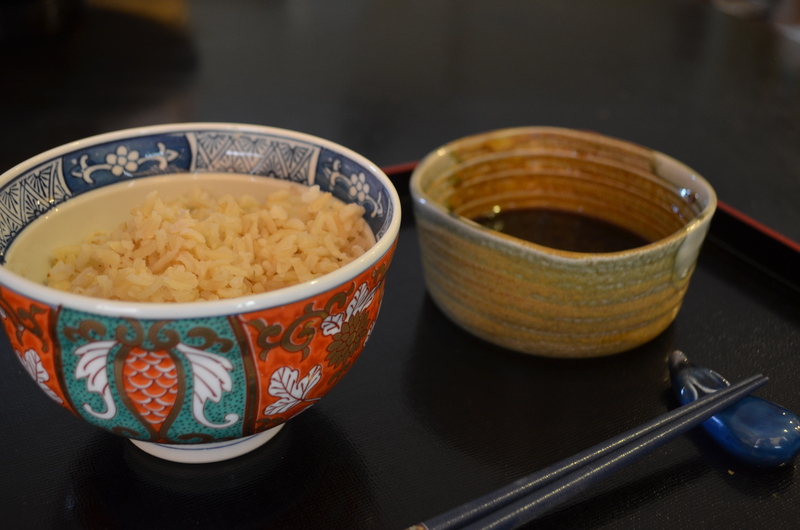 In a small bowl, combine ingredients for sesame soy sauce and mix. Add in half of the chopped green onions as well as sesame seeds, then set aside. Place 2 cups vegetable pancake mix with 2 cups of water in a bowl. If your package of vegetable pancake mix wants you to use a different amount of water, follow their instructions instead. Mix well until there are no lumps. Then mix in the gochujang. 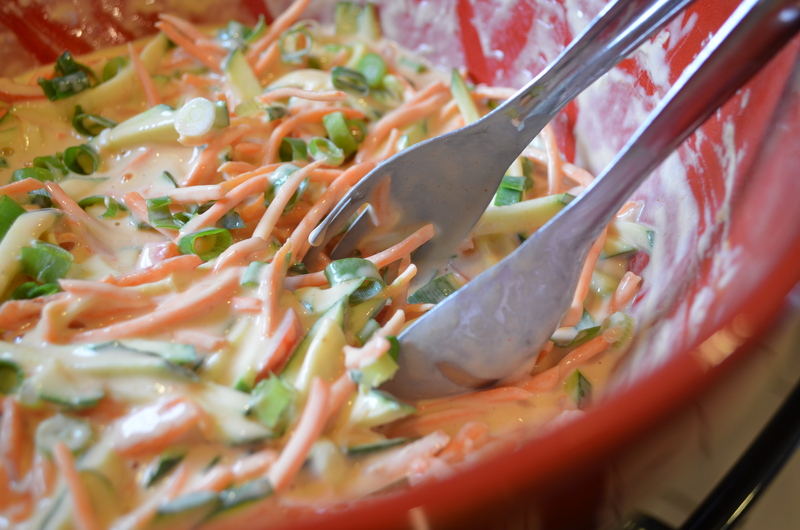 Add vegetables into the batter. Mix well. Scoop out ½ cup of batter mixture and pour into the skillet. 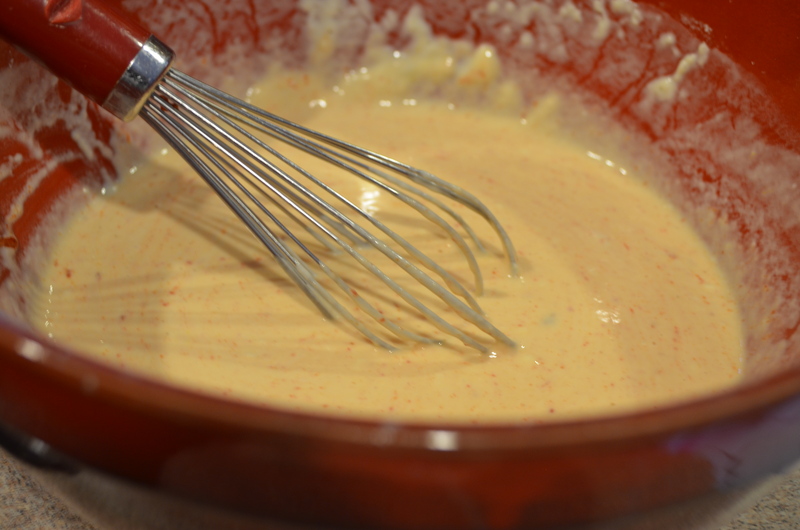 Fry the batter mixture on both sides until browned and crispy. Serve with the sesame soy sauce and enjoy! If there’s one thing I absolutely love, it’s fried rice! Whenever my mom makes it, the aroma brings me straight to the kitchen. After a party we had, our fridge had a giant tub of fried rice left over. Guess what I ate for the next two days? The egg rolls that we also had left. My mom thinks it’s weird that I like fried rice so much. And to that I say, Mom. How could you not love fried rice? Okay, so actually my mom does like fried rice. I mean, she’s the one who made this! My mom has been such an important figure in this blog it’s not even funny. She’s the one who can cook, so she’s a pretty important piece to the puzzle! She’s just not a very good teacher, since I still can’t cook well. But if it means anything, I can crack an egg! 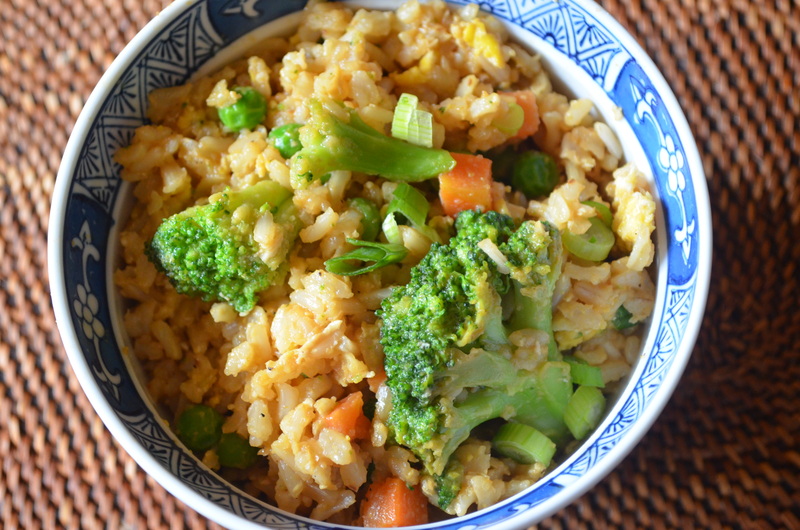 The great thing about fried rice is how versatile it is! It’s usually made from leftover rice, it’s easy to bring for baon (Tagalog for “packed lunch”), and it’s great to snack on! Especially snack on… Isn’t that its whole purpose? Okay, I’ll stop talking now. 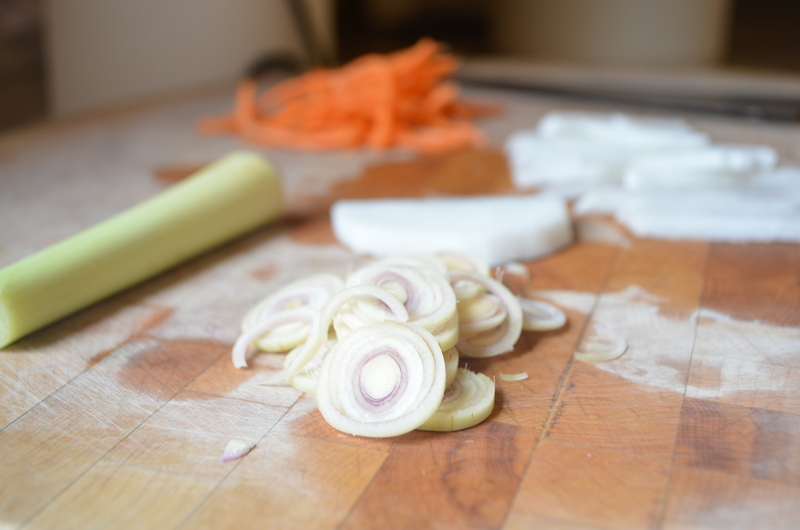 I know all you care about are the pictures… and maybe the recipe. Mix the fried rice sauce ingredients in a bowl completely and set aside. Heat 2 tablespoons olive oil in a wok. 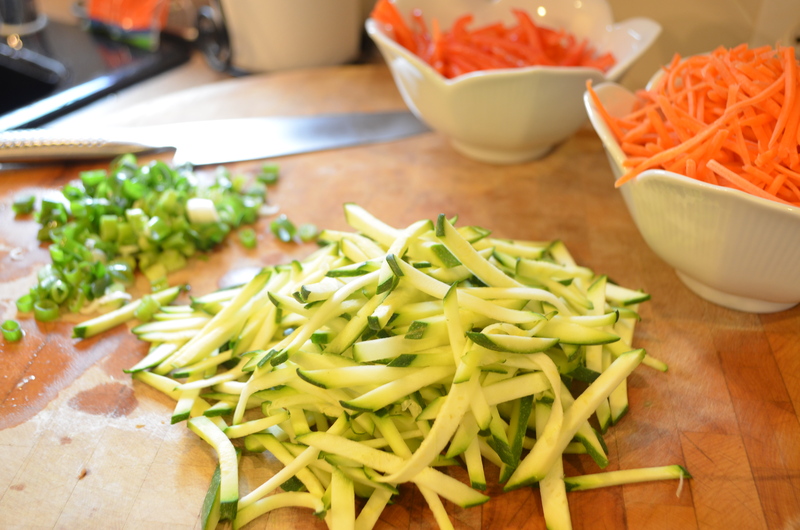 Add broccoli, peas, carrots, and green onions—but be sure to leave some for garnish. Stir fry. 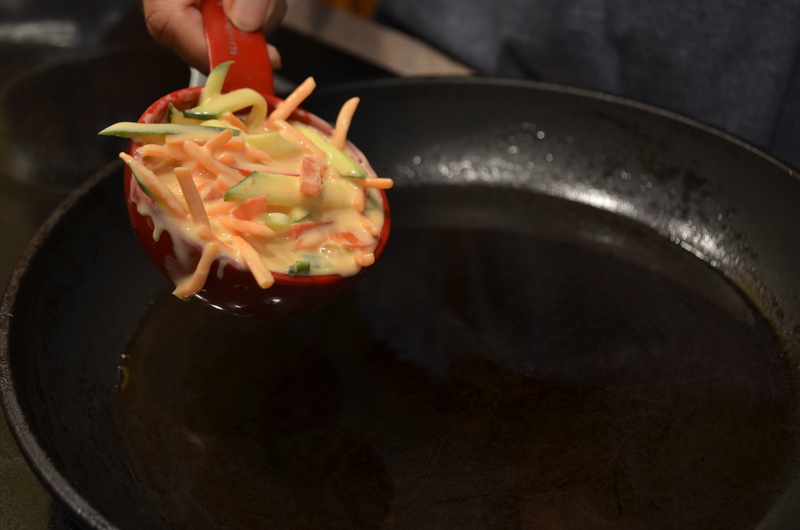 Make space in the middle of the wok and crack 1 egg. 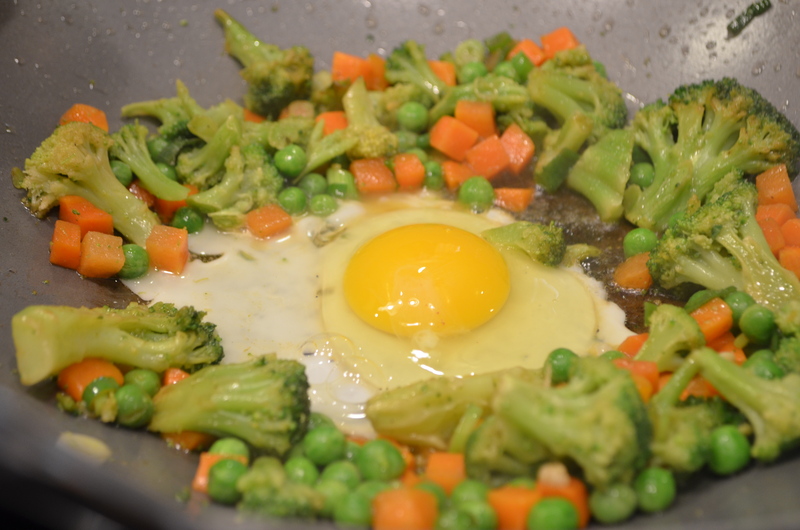 Stir the egg, then mix the egg with the vegetables. Add 3 cups of cooked jasmine rice. 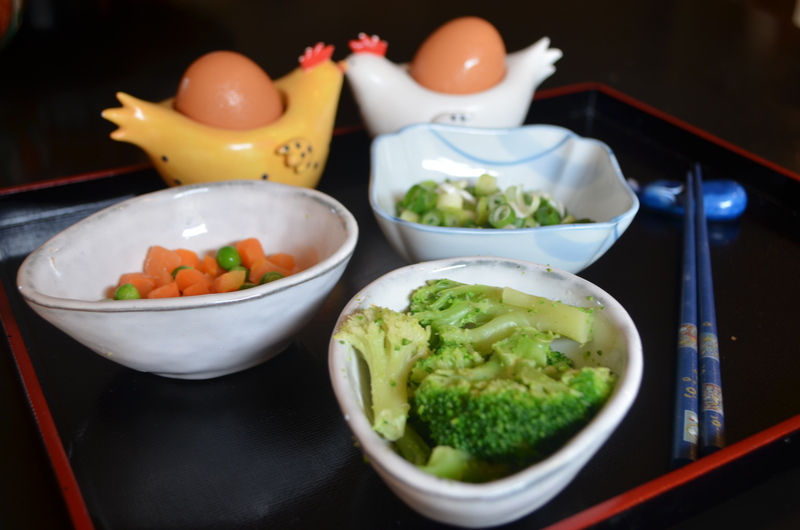 Stir fry with the egg and vegetables. Make space in the middle of the wok and crack the remaining egg. 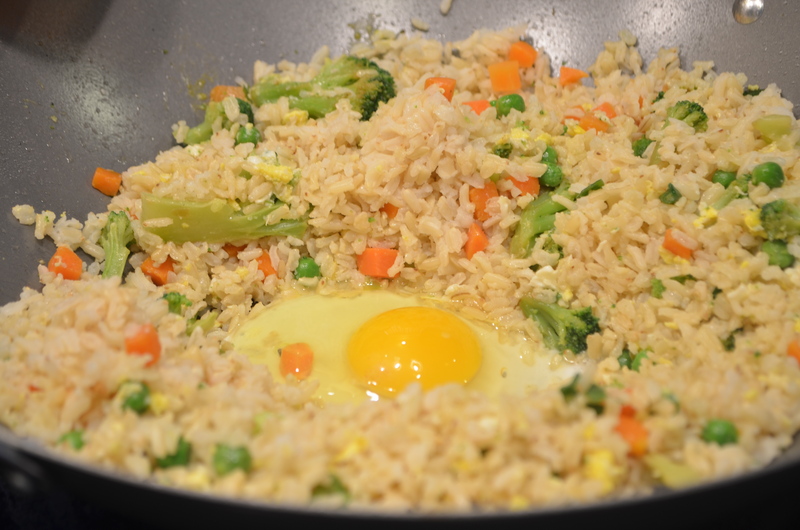 Stir the egg, then mix the egg with the rice and vegetables. Add fried rice sauce gradually. Continue to stir fry. Add a dash of black pepper. Stir fry. 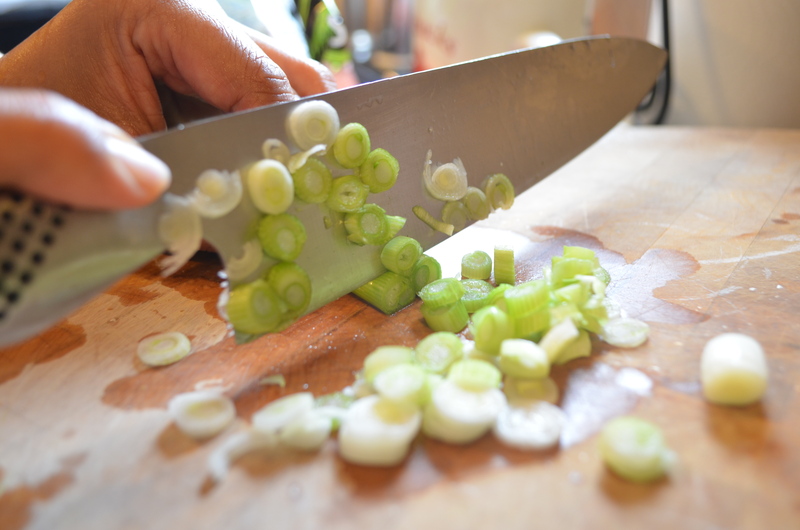 When everything is mixed and cooked, serve in small bowls and garnish with the rest of the chopped green onion. 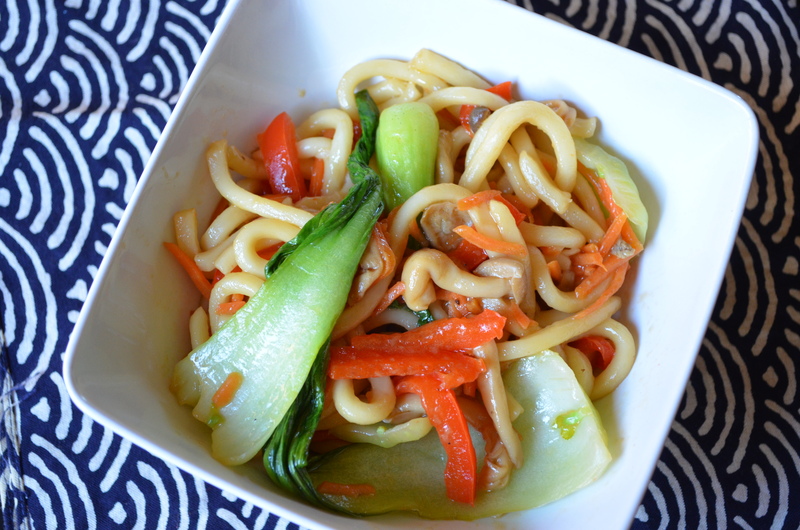 I’ve always loved udon noodles, whether it was in a stir fry or in a soup. Maybe that was a product of living in Tokyo as a baby, but I’m not sure. Maybe a love for udon noodles—or noodles of any kind—is just ingrained into anyone with the slightest bit of Asian blood? It’s completely possible, and I don’t see any scientific evidence disproving my theory! Stir fried noodles are pretty common in my household. I mean, how can you go wrong with the delicious taste of udon noodles with vegetables? There’s something simply enticing about getting a steamy, mouth-watering bowl of noodles. 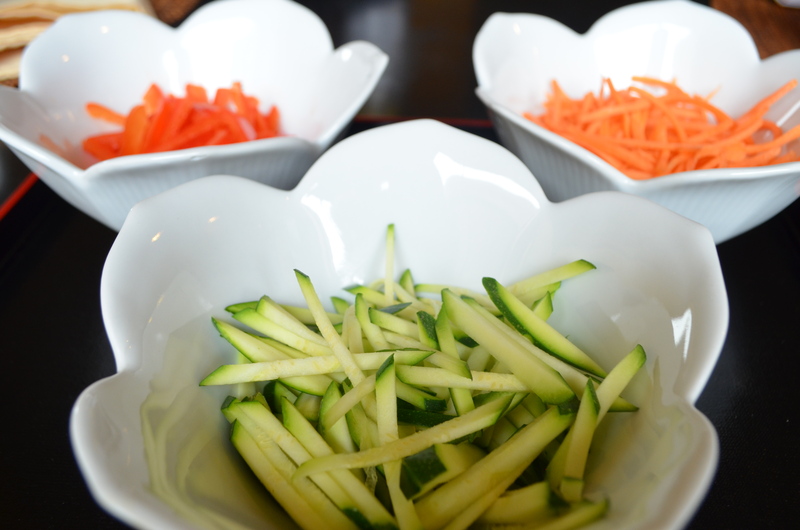 Each time you go in with your fork (or chopsticks), you get a different flavor from all the vegetables. Sometimes you get a crunchy vegetable. Other times you get a soft vegetable. You can even get a vegetable that’s soft on top and crunchy on the bottom, like bok choy! 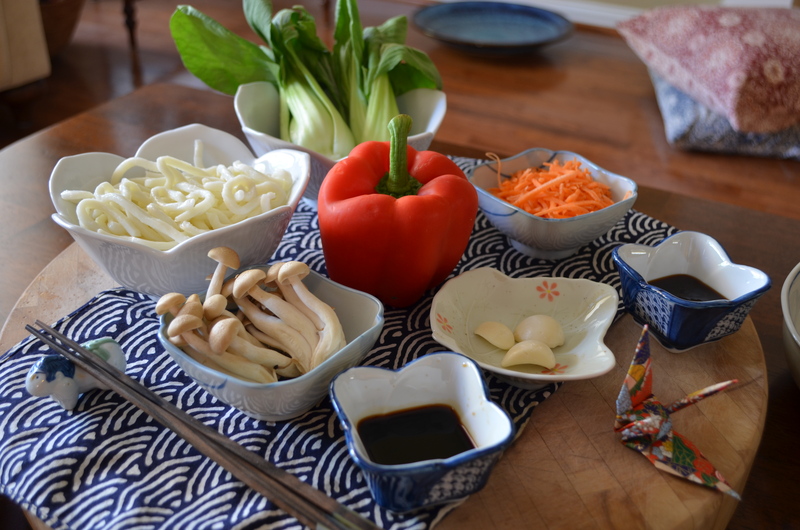 The great thing about bok choy is everything is that, like udon noodles, it soaks up the flavors around it, from the sweet stir fry sauce, to the taste of the freshly cut carrots, and to even the savory mushrooms. 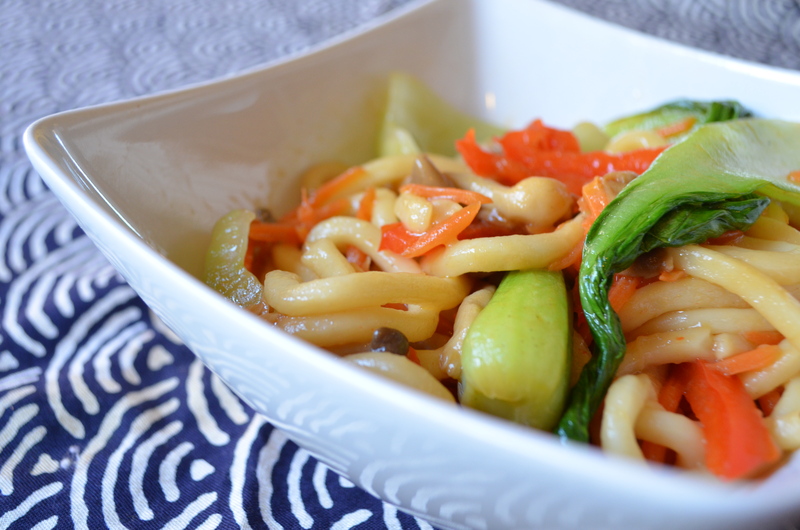 The best part about this udon stir fry is that it’s super easy to make and doesn’t even take very long. You’re still eating a kind, vegetarian diet, as well as being quite healthy. It’s pretty much a win, win, win, win. Heat the olive oil in a wok, then add the minced garlic. When the garlic is a little brown, add the carrots, bell pepper, mushrooms, and bok choy. Stir fry until the vegetables are tender. 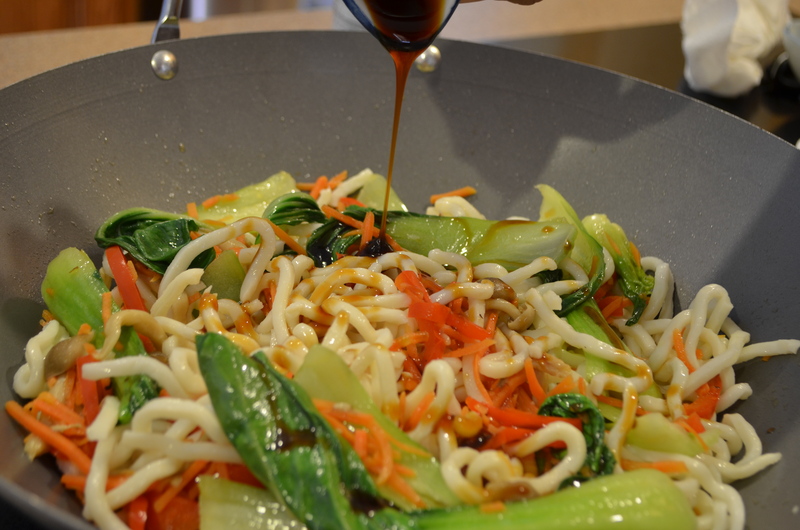 Add the udon noodles and pour on the stir fry sauce and soy sauce. Stir fry until you are happy with the texture of the udon noodles. Adjust the amount of sauces you use according to taste.